Equine sports massage therapists use their knowledge of anatomy, physiology, and massage techniques to alleviate pain and improve a horse’s range of motion. Top level equine athletes (including Olympic competitors and racehorses) often receive such services. Individuals that hold a Doctor of Chiropractic or Doctor of Veterinary Medicine degree can become licensed animal chiropractors, a more advanced qualification. Professional braiders travel the horse show circuit and braid manes and tails for competition. A good braider can earn $50 to $100 per horse. Braiders often work through the night or start very early in the morning, so that they can get their work done before the start of the show. Braiding can be a full-time or part-time job, depending on where you are located and your willingness to travel. Equine dental technicians perform common dental services such as floating teeth (filing down sharp edges to ensure proper wear for eating and performance activities). While the regulations about dental technicians vary from one state to the next, this can be a lucrative career path as horses regularly require dental work. Dude ranch wranglers guide tourists on trail rides and assist with saddling and equine care. 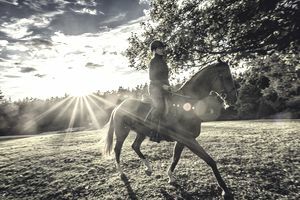 Those working in this career path may have the opportunity to work in beautiful surroundings and with some very nice trail horses. Lodging and meals are usually provided in addition to salary. Therapeutic riding instructors teach lessons for students affected by a variety of emotional, behavioral, and physical challenges. There are several certification programs (the most prominent being PATH which offers a three-level certification process). This can be a particularly rewarding career path as instructors are able to directly enhance the lives of their students. Equine pharmaceutical sales reps travel an assigned territory to promote their products to veterinarians. This can be a particularly lucrative career in a fast-paced environment, and you can easily transition into other animal health and animal product sales positions after working in this role. Saddle fitters evaluate and adjust the balance of the saddle to ensure that the horse and rider can perform effectively. This is a travel-intensive role, as the fitter must visit clients across a potentially large territory. While many people have not heard of this career path, it is growing in popularity and practitioners can command a decent rate ($75 to $100 per fitting consultation). Equine association representatives can work for a number of equine groups and clubs such as the USEF, USDF, AAEP, and breed organizations. These associations hire a variety of administrative staff members, customer service reps, registrars, writers, and marketing personnel. There is money to be made working as a professional rider, though this is an option accessible only to top-level competitors. Professional riders often travel the show or polo circuits, being paid directly for their services by clients or earning prize money on their own as independent contractors. Others travel with equine performance shows or work at theme parks. Some riders may also earn money from offering clinics to train other equestrians and their horses. Mounted police officers patrol a designated area on horseback, providing crowd control and interacting with members of the public. Candidates hoping to become mounted officers must first qualify as regular police personnel and work for a few years in such roles before applying for mounted duty. This is a great way to combine dual career interests in the equine and law enforcement fields.